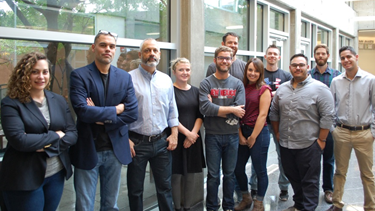 Professors John Whitlow and Serge Martinez (second and third from left) with students in the Fall 2017 Economic Justice Clinic. The EJC works to reduce structural inequality and promote equitable economic development in low-income communities through legal support for community-based organizing efforts in the areas of workers’ rights, housing, and grassroots entrepreneurship. The EJC takes on wage theft and eviction defense cases from a number of community partners, and also works on law reform campaigns aimed at increasing access to justice. Professors Serge Martinez and John Whitlow developed the EJC, an outgrowth of the former Business and Tax Clinic, in an effort to provide students with the opportunity to gain significant advocacy experience in public interest work. Through the EJC’s three primary focus areas—worker’s rights, housing, and grass roots entrepreneurship—students gain direct experience in client interviewing and counseling, legal research, drafting of pleadings, motion practice, legislative advocacy, negotiation, and collaborative lawyering. Students in the EJC have the opportunity to work with clients beginning at the intake interview level, and often see their cases through to an outcome in court. This substantive direct practice experience not only benefits the EJC’s students, but provides a significant service to community members facing economic injustice who may otherwise not be able to obtain representation due to a lack of resources and access. The EJC enables students to help underserved communities navigate these systemic obstacles. Lauren Kedge says her work in the EJC has changed her perspective on economic justice issues. Carlos Padilla says the EJC Clinic has been one of the better experiences he’s had in law school.